If you make pieces intended for display, you’ll need good stands to showcase them. My first bases were made of sterling silver but now that the pieces are getting bigger I use exotic woods. 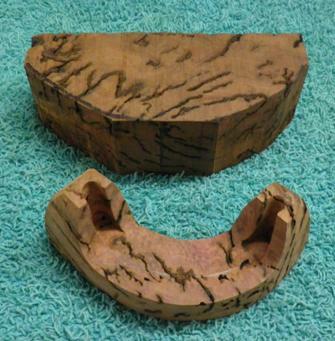 I find the burls of a tree have the most interesting patterns and colours and help to make your scrimshaw look professional. Many pieces of ivory won’t stand up without support so they need something to hold them in place and you may as well make the stand look as nice as possible. You’ll need to contact a specialist timber yard that sells to cabinet makers or luthiers. I buy my wood from Neale and his wife Carla at www.djarilmari.com where they sell some very nice pieces of top quality wood. I also get offcuts from the local timber yard or cabinet makers workshops, you only need small offcuts, 20cm x 10cm by 5cm thick. Jim Stevens shows how to make a simple but effective base on pages 92 – 94 of his book “Scrimshaw Techniques”. 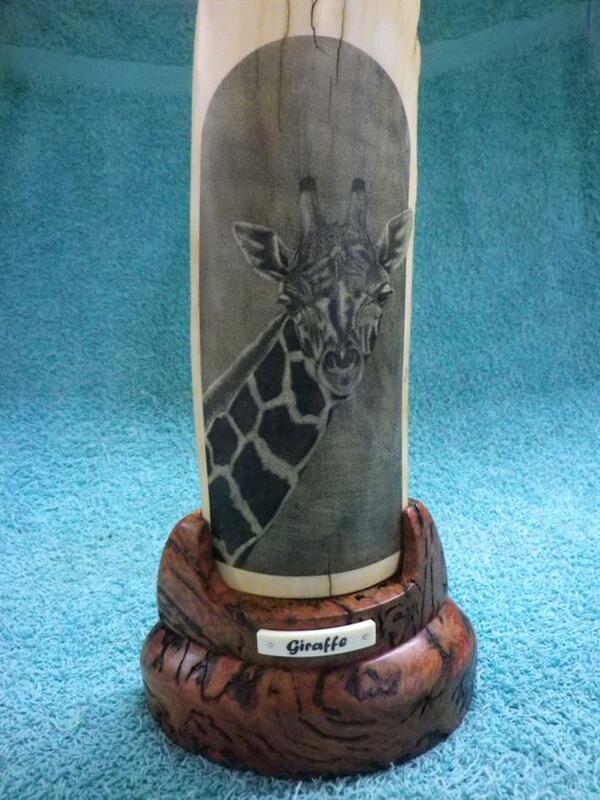 The piece I used as the stand for the Giraffe Scrimshaw is Salmon Gum Burl. The pictures are pretty self explanatory but I’ll describe what I personally do anyway. I roughly cut my chosen wood with a band saw and drill notches for the ivory. After that I sand it with a belt sander, then with 180 grit and 600 grit on an orbital sander. Next, I sand it by hand and rub it with ‘Eee Ultra Shine’. My first stands were made by hand using a saw and file, but it took forever; sometimes even longer than the actual Scrimshaw. 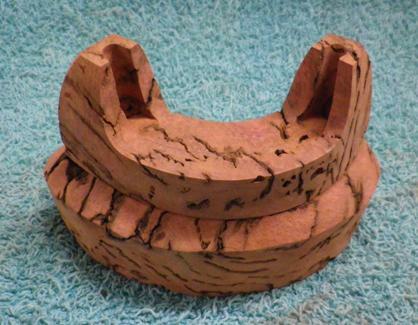 For examples of top quality Bases/Stands go to www.scrimshawgallery.com. You’ll notice that I like to add a name plate to the base in the same style as can be seen in many American pieces. I use a thin piece of mammoth ivory filed to match the curve of the base. Then I make use of a process called ‘Acetone Transfer’. Google “Acetone Transfer” to find a wide selection of sites that describe the process. Make sure you print in mirror opposite using a laser printer. 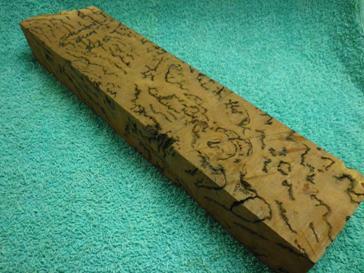 Once you have the lettering transferred, it’s quite simple to Scrimshaw the letters with ink/ oil paint. I prefer oil paint because it gives a better coverage to your stippling. Then I simply drill the back and attach two 925 sterling silver pins, for strength I also add a little wood glue.